In the past two years, I have assisted many men & women in their 40s & 50s who got laid-off; some from a job they enjoyed; others who didn’t—but all of them had resisted making a career change until it was forced on them because of the Golden Handcuffs syndrome. In effect, they felt compelled to stay with their employers because they had an income and lifestyle that offset any job stress or dissatisfaction. Being let go, for any reason, is a blow to the confidence of anyone. But once they are laid off, almost 60% of them think they don’t need any help with their job search and can figure it out for themselves. In almost all cases, they are surprised, even shocked, to discover how difficult it is to get another job with a similar compensation package…or find an opportunity that stimulates them. Before they know it, they are out of work for more than a year, their savings are vanishing, and they soon realize that they need a job ASAP. But because they had no clear plan or motivation for a job change or career move, the competition for interim jobs-to-get-by-and-pay-bills is not only intense but often goes to individuals with less education and experience because the risk that they will get something better in the short term and move onto another employer is much lower. We all know people in this situation. 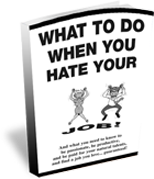 When we have good jobs, we often feel powerless to change our situation, so we accept our Golden Handcuffs as necessary…until we too get a pink slip. What is to be done? 2. Prevent Career Obsolescence. Do whatever you can to keep your skills marketable and your qualifications in mint condition. Whenever possible, invest in transportable skills that you can carry across economic sectors or job situations. 3. Take a Long View. Get a proper career assessment done. Be sure you know the several dozen jobs that you are suited for, based not only on your education & experience (which may have landed you into a Golden Handcuffs role that cannot be replicated elsewhere), but of your talents & motivations, your real value proposition! 4. Reflect on Unsavory Options. Although self-employment is not for everyone, especially for individuals who do not manage financial uncertainty well, thinking about how you could start a business on your own or with partner(s)…it may prove more secure and rewarding than being at someone else’s beck and call. 5. Network Forever. Any business is about relationships. Join professional organizations, community groups, or just lunch more frequently with friends to discuss the changing dynamics of our economy and workplaces. Pay it forward, help out when you can because the contacts that you nurture now can open doors when you unexpectedly need them. 6. Get Professional Help. The digital era is ushering in new job search tools and techniques, and having an effect on how to interview, negotiate, and strategize for better job opportunities. Engage a career professional to update and upgrade your toolbox to optimize your chances of making a successful move if or when the time comes. Finally, don’t get complacent. Do a few things now to avoid finding out the hard way how Golden Handcuffs can add stress and pain to your life!